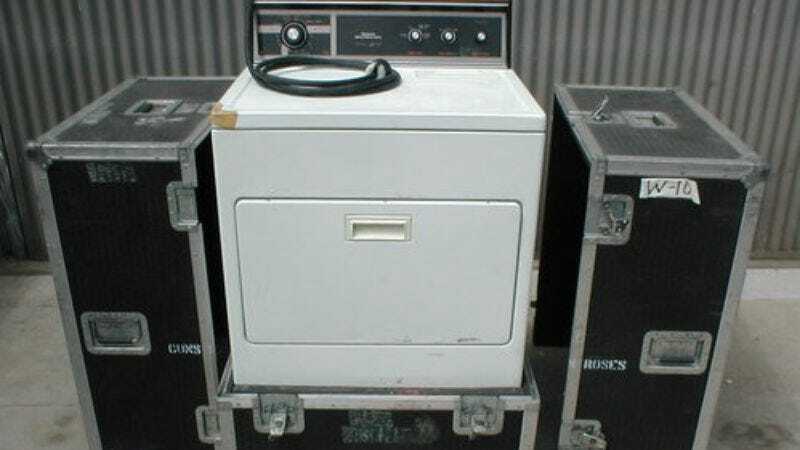 Back in the '80s, when Guns N’ Roses was touring a lot, the band must have had a lot of sweaty bandannas and crudely snipped sleeveless T-shirts to wash. That’s why the band purchased a sweet, utilitarian W-10 Kenmore Dryer to take on the road. (After all, it’s got “ultra fabric care.”) Now that times have changed and the band’s doing more residencies than long runs, Guns N’ Roses are looking to unload their not-so-gently used dryer on eBay, meaning for a starting bid of just $99, any metal maniac out there could soon be washing his or her underwear in the same machine that Axl Rose didn’t wash his. The dryer comes complete with vented road case and, while it was working prior to storage, it hasn’t been tested in a while, so caveat emptor. The whole thing weighs 278 pounds, and purchasers are responsible for the cost of shipping via freight. The auction is part of a large warehouse clearing that Team Guns N’ Roses appears to be undertaking, and while nothing else is quite as glamorous as the dryer, other items currently up for sale include an original pair of Peter Criss boots, several 8-track audio recorders that may or may not have been used by the group, and a mixing console.